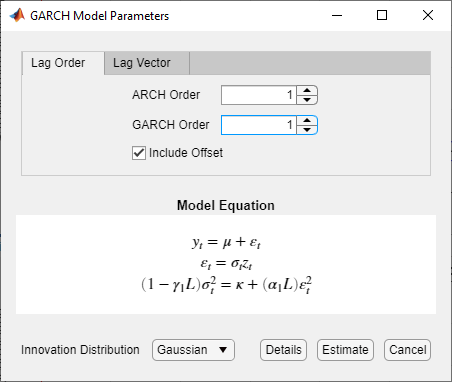 This example shows how to select the appropriate number of ARCH and GARCH lags for a GARCH model by using the Econometric Modeler app. The data set, stored in Data_MarkPound, contains daily Deutschmark/British pound bilateral spot exchange rates from 1984 through 1991. At the command line, load the Data_MarkPound.mat data set. In the Import Data dialog box, in the Import? column, select the check box for the Data1 variable. The variable Data1 appears in the Data Browser, and its time series plot appears in the Time Series Plot(Data1) figure window. The exchange rate looks nonstationary (it does not appear to fluctuate around a fixed level). 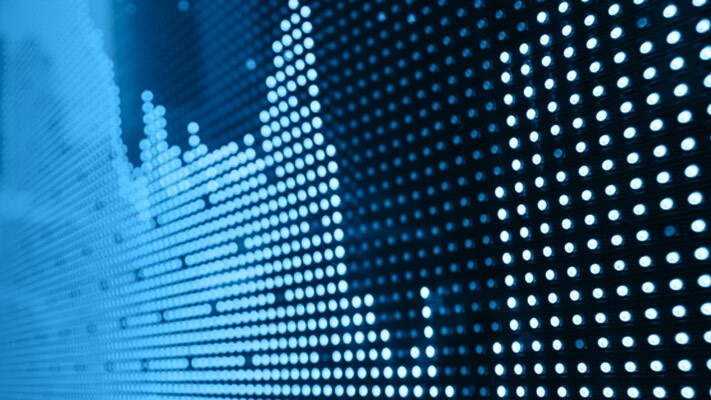 Convert the exchange rates to returns. With Data1 selected in the Data Browser, on the Econometric Modeler tab, in the Transforms section, click Log. 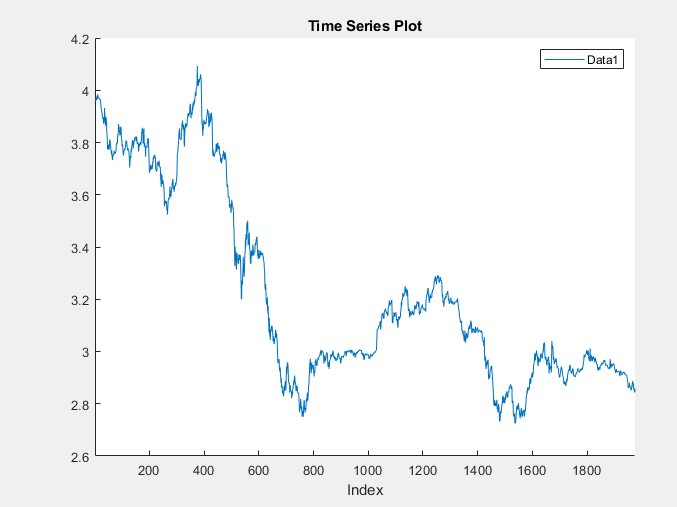 In the Data Browser, a variable representing the logged exchange rates (Data1Log) appears , and its time series plot appears in the Time Series Plot(Data1Log) figure window. In the Data Browser, select Data1Log. In the Data Browser, a variable representing the returns (Data1LogDiff) appears. A time series plot of the differenced series appears in the Time Series Plot(Data1LogDiff) figure window. Rename the Data1LogDiff variable to Returns. In the Data Browser, right-click Data1LogDiff. The app updates the names of all documents associated with the returns. The returns series fluctuates around a common level, but exhibits volatility clustering. Large changes in the returns tend to cluster together, and small changes tend to cluster together. That is, the series exhibits conditional heteroscedasticity. Close all figure windows in the right pane. In the Data Browser, select the Returns time series. Drag the PACF(Returns) figure window below the ACF(Returns) figure window so that you can view them simultaneously. 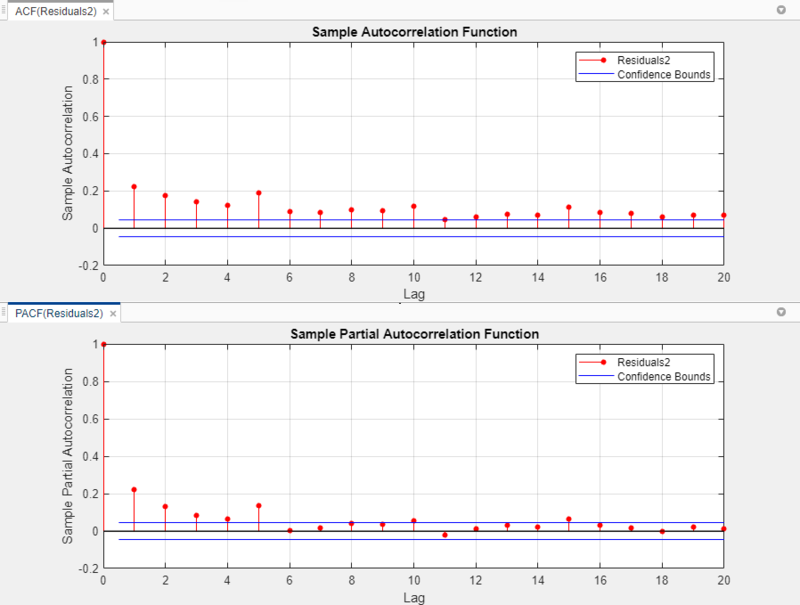 The sample ACF and PACF show virtually no significant autocorrelation. Conduct the Ljung-Box Q-test to assess whether there is significant serial correlation in the returns for at most 5, 10, and 15 lags. To maintain a false-discovery rate of approximately 0.05, specify a significance level of 0.05/3 = 0.0167 for each test. Close the ACF(Returns) and PACF(Returns) figure windows. With Returns selected in the Data Browser, on the Econometric Modeler tab, in the Tests section, click New Test > Ljung-Box Q-Test. On the LBQ tab, in the Parameters section, set Number of Lags to 5. Set Significance Level to 0.0167. Repeat steps 3 through 5 twice, with these changes. Set Number of Lags to 10 and the DOF to 10. Set Number of Lags to 15 and the DOF to 15. The test results appear in the Results table of the LBQ(Returns) document. The Ljung-Box Q-test null hypothesis that all autocorrelations up to the tested lags are zero is not rejected for tests at lags 5, 10, and 15. 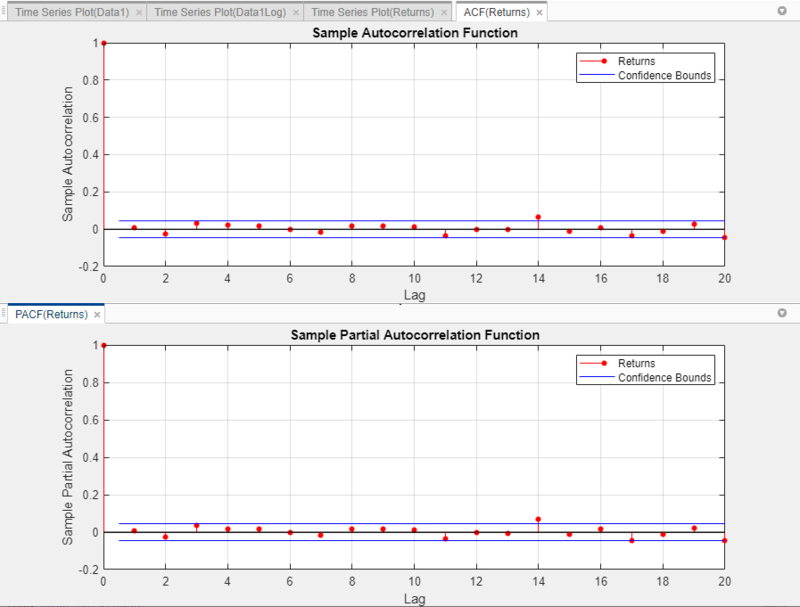 These results, and the ACF and PACF, suggest that a conditional mean model is not needed for this returns series. To check the returns for conditional heteroscedasticity, Econometric Modeler requires a series of squared residuals. After importing the squared residuals into the app, visually assess whether there is conditional heteroscedasticity by plotting the ACF and PACF of the squared residuals. Then, determine the appropriate number of lags for a GARCH model of the returns by conducting Engle's ARCH test. Compute the series of squared residuals at the command line by demeaning the returns, then squaring each element of the result. In the Data Browser, right-click Returns. Returns appears in the MATLAB® Workspace. Remove the mean from the returns, then square each element of the result. To ensure all series in the Data Browser are synchronized, Econometric Modeler prepends first-differenced series with a NaN value. Therefore, to estimate the sample mean, use nanmean. Create a table containing the Returns and Residuals2 variables. The app must clear the Data Browser and all documents before importing new data. Therefore, after clicking Import, in the Econometric Modeler dialog box, click OK. In the Import Data dialog box, in the Import? column, select the check box for the Tbl variable. 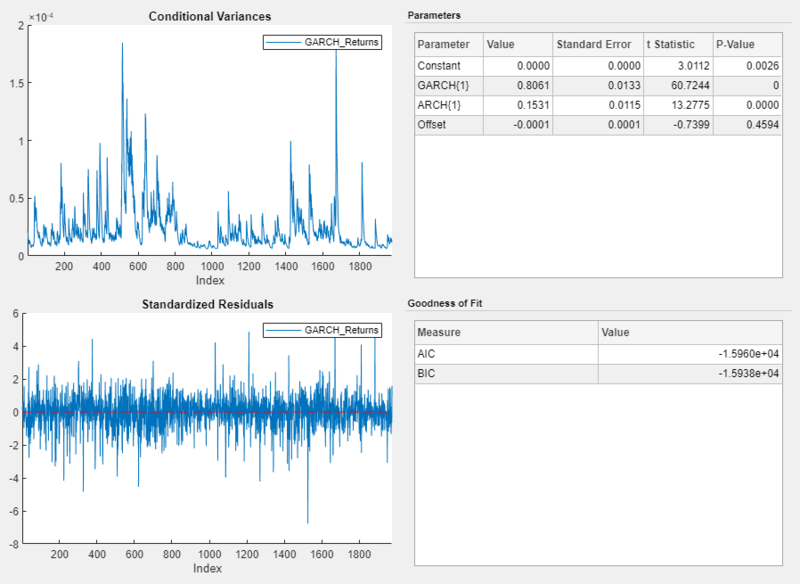 The variables appear in the Data Browser, and a time series plot of all the series appears in the Time Series Plot(Residuals) figure window. Plot the ACF and PACF of the squared residuals. 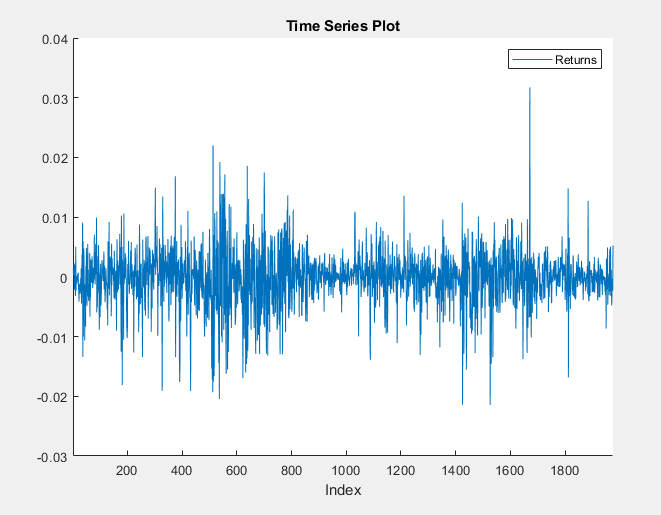 Close the Time Series Plot(Residuals) figure window. In the Data Browser, select the Residuals2 time series. Drag the PACF(Residuals2) figure window below the ACF(Residuals2) figure window so that you can view them simultaneously. The sample ACF and PACF of the squared returns show significant autocorrelation. This result suggests that a GARCH model with lagged variances and lagged squared innovations might be appropriate for modeling the returns. Conduct Engle's ARCH test on the residuals series. Specify a two-lag ARCH model alternative hypothesis. In the Data Browser, select the Residuals time series. The test results appear in the Results table of the ARCH(Residuals) document. Engle's ARCH test rejects the null hypothesis of no ARCH effects in favor of the alternative ARCH model with two lagged squared innovations. An ARCH model with two lagged innovations is locally equivalent to a GARCH(1,1) model. Fit a GARCH(1,1) model to the returns series. Because the returns required demeaning, include an offset by selecting the Include Offset check box. The model variable GARCH_Returns appears in the Models section of the Data Browser, and its estimation summary appears in the Model Summary(GARCH_Returns) document. An alternative way to select lags for a GARCH model is by fitting several models containing different lag polynomial degrees. Then, choose the model yielding the minimal AIC.